When it comes to the distant universe, even the keen vision of NASA’s Hubble Space Telescope can only go so far. Teasing out finer details requires clever thinking and a little help from a cosmic alignment with a gravitational lens. 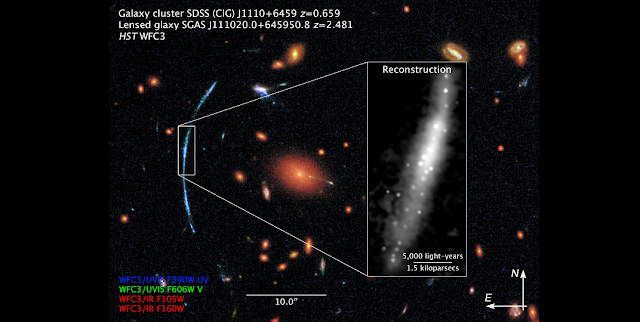 By applying a new computational analysis to a galaxy magnified by a gravitational lens, astronomers have obtained images 10 times sharper than what Hubble could achieve on its own. The results show an edge-on disk galaxy studded with brilliant patches of newly formed stars.